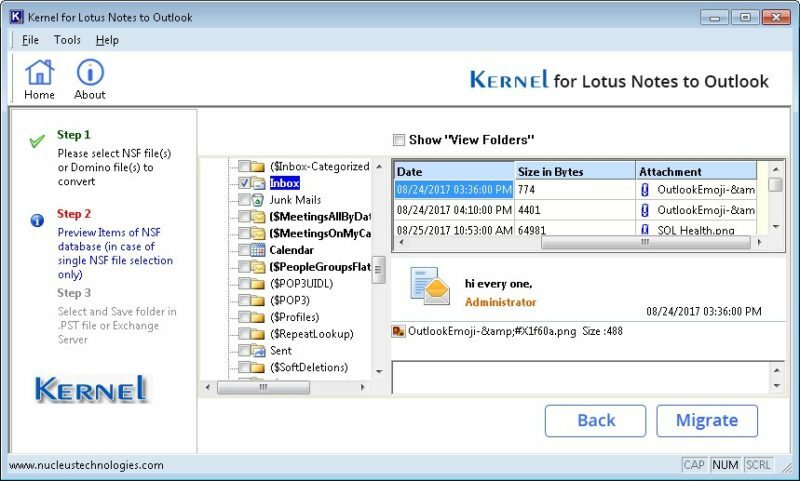 MS Outlook stores emails and other items in PST format while IBM Lotus Notes uses NSF format to store user emails and other information. If you are planning to move from Lotus Notes to Microsoft Outlook then there is a need to Convert NSF files to PST. There is a manual method to convert NSF files to PST, but it includes several risk and it might lead to data loss. So using third party NSF to PST Converter for smooth and efficient conversion is always a good option. Today we will review features of Kernel for NSF to PST converter, a third party application widely used for conversion of NSF files to Outlook PST file There is no worry of data loss as the it moves each and every piece of data in structure manner maintaining the folders and sub-folders of NSF. Most of the users ask which is the best NSF to PST converter? while testing various email migration tool we can easily tell, the Kernel NSF to PST tool is the best of all. Not only its user interface, but the original properties of of files that are converted are intact after conversion. Thus, one can easily get Outlook PST file from Lotus Notes NSF format. It supports batch migration, selective conversion and compatible with all version of NSF. Migration from Lotus Notes and Domino Server: Kernel NSF to PST tool not only migrate NSF files to PST, but also provide access to domino server. Thus you can directly migrate from Lotus Notes Domino Server to MS Exchange Server. It also supports Batch file conversion of NSF files to PST. Convert to Multiple PST Files: if you have a large Lotus Notes NSF file then you can save the data in multiple PST files. This makes management of PST file easy as large PST file might corrupt the data. This protects the PST file from vulnerable. Manual or Automated Migration: Well NSF to PST converter has two options by which you can convert NSF files using manual method or automatic method. The Manual method includes exporting the files in CSV (Comma Seperated Value). Automatic method directly transfers the NSF file data to PST file. Selective Data Conversion of NSF Files: In many cases it happens that the user require to convert only specific data items according to the date and messages. Thus, Kernel NSF to PST converter allows users to sort data items according to date range, subject and other fields. Users have the option to select folder name ‘All’, ‘Skip hidden views and folders’, ‘Select/ unselect items for migration’. Multiple Saving Options: Kernel for NSF to PST converter has the option to save files on MS Exchange Server. The converter gives user the option to save NSF file in Text, RTF and HTML format too. Interactive GUI: Kernel for NSF to PST converter is designed in a manner that it is easy to use. It’s interactive GUI and self-instructed interface makes it user friendly. It directs user for next step and one can easily use the Kernel NSF to PST Converter.